Welcome to the second installment of my “5 Questions” series. On a weekly or bi-weekly or completely random basis, I will interview an author or illustrator and focus on a specific book. In the coming weeks, we’ll spend time with Matthew Cordell, Jessica Olien, Matthew McElligott, Lizzy Rockwell and more. Why? I like these people and I love their books. Sue me. Today we get to hang out with Hazel Mitchell, who is as glorious as a glass of champagne at a good wedding. Drink deeply, my friends . . .
JP: Greetings, Hazel. Thanks for stopping by my swanky blog. I hope you don’t find the vibe too intimidating. I put up the tapestry just for you. 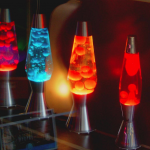 The lava lamps have been here for a while. Because nothing says “classy” quite like a lava lamp. Sit anywhere you like, but the milk crates are most comfortable. Hazel: Thanks, JP. This is certainly an eclectic place you’ve got here. Wow, is that a glitter ball? Next you will be wearing a white suit. 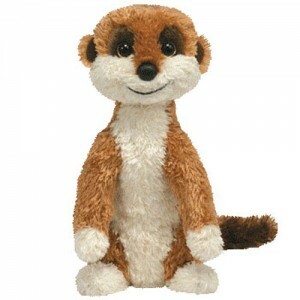 Excuse me while I remove this stuffed meerkat from the milk crate . . . Careful with that meerkat, it’s expensive. Hey, do I detect an accent? Wait, let me guess! You are from . . . Kentucky? No getting anything past you! Kentucky, Yorkshire, England. OK, just Yorkshire, England. I’m a late pilgrim. We recently sat side-by-side at the Warwick Children’s Book Festival, where I got the chance to read your wonderful new picture book, Toby, and eavesdrop on your lively interactions with young readers. At times, alarmingly, you spoke in the voice of a hand puppet. 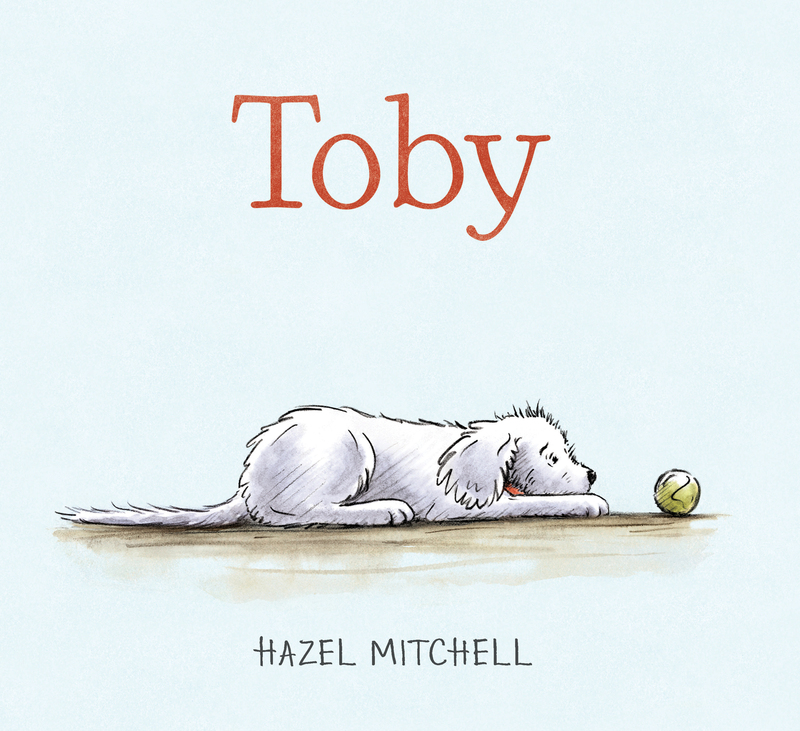 So let me see if I’ve got this straight: Toby is a real dog, but not a true story, exactly? How does that work? Yes, we did sit next to each other and it was a lot of fun to see you in action! I didn’t know you were eavesdropping, I’d have dropped in some of those Shakespearean ‘asides’ just for you. And I must watch that hand puppet voice, I even do it without the hand puppet . . .
OK, to the question: Yes, Toby is a real dog. I rescued him from a puppy mill situation back in 2013. He was so endearing and his journey from frozen dog to bossy boots captured my heart. I began drawing him, because that’s what illustrators do, and before I knew it I was weaving a story round him. But I didn’t want to feature myself as the owner in Toby’s story, that was kind of boring and I figured Toby needed a younger owner, one who children could relate to. So I gave Toby a boy who adopts him and a Dad who is struggling with moving house, looking after his son AND now a new dog. The fictionalized setting gave me lots of ideas and emotions to play with, but the stuff Toby gets up to in the book is taken from things he did in real life. I can see it’s a work that comes from your heart. And by “see” I mean: I could feel it. A heartwarming story for young children living in a cynical age. The book is beautifully designed. I especially admire the pacing of it, the way you vary the number and size of the many illustrations. Please tell me a little about that decision-making process. Thank you. 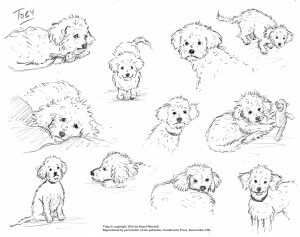 I love that you say ‘feel.’ I wanted this book to be about emotions and feelings and bring the reader into the internal dialogue of the boy and dog’s fears and frustrations. Just small things you know, but life is full of small things that make up the big things. And again, thank you for your kind words on the design, working with Candlewick, my editor (Liz Bicknell) and art director (Ann Stott), was a joy. We did a lot of drafts at rough sketch stage and as the layout of the book evolved a lot of graphic novel style panels crept in and then the wide double-spreads to open out the story. I like how it flows. The choice of colors really adds to the story I think, moody blues and beiges that reflect the emotions and then brighter colours when things are going well. 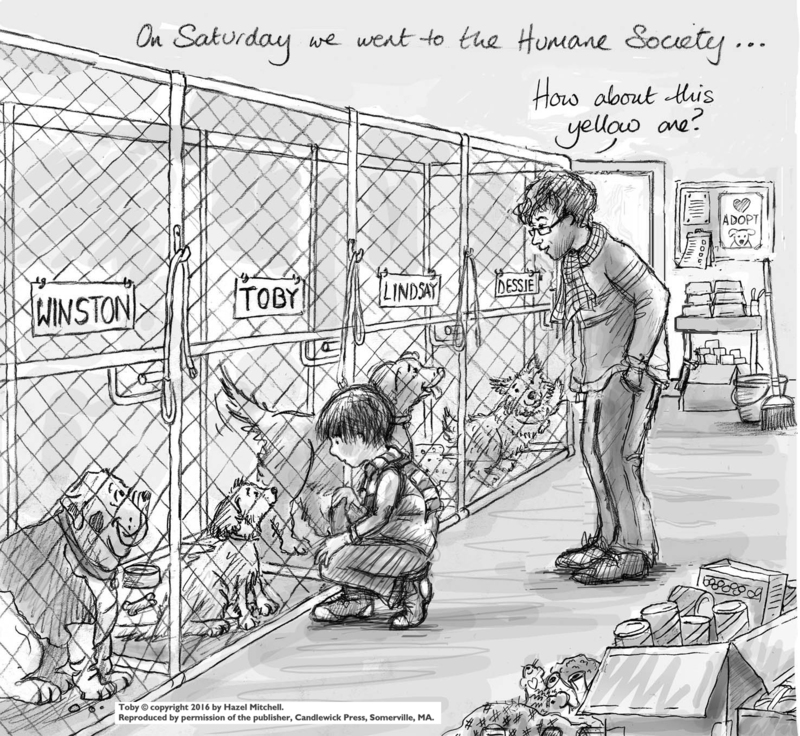 The boy and dog are connected by the colour red –- Toby’s collar and the boy’s sneakers. Oh, thank you, Hazel, for sharing those behind-the-scenes details. 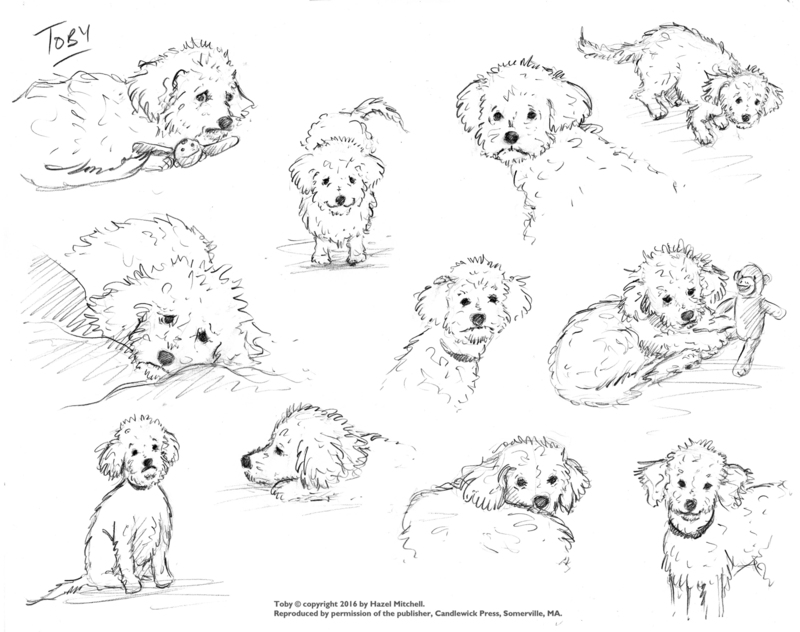 I appreciate seeing the black-and-white sketches, too. I think even when readers don’t consciously notice those subtle details, they still manage to seep into our unconsciousness. It’s fascinating how much thought goes into the work that most readers probably don’t think they see. I like that your book doesn’t gloss over the challenges of owning a dog. It’s not always cuddles and sunshine. Why did you feel it was important to include the downside of dog ownership? Because that is the reality of life and children are very capable of dealing with realities and working through problems. Sometimes it’s adults who want everything to be cuddles and sunshine, and try to save youngsters from the real world. Well we can’t do that, because it comes at us fast. I never get tired of seeing or hearing about a child responding to a book and saying, “Yeah, that happened to me,” or “I know that feeling.” It’s like you’ve been given a gift. I see that you live in Maine. You must get this question a lot, but why isn’t Toby a moose? Do you see many moose up there? 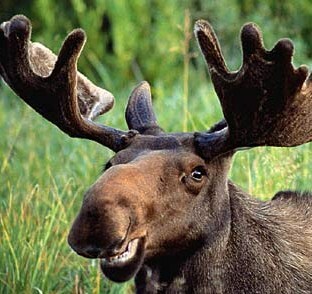 Can we please just talk about moose for a little while? And what goes on in Maine? Do you eat lobster all the time? While reading Stephen King? Or do I have some misconceptions? How did you end up there? Toby channels his inner moose at times, which is scary in a poodle. There aren’t so many moose around our way, but drive a little North and there is moose-a-plenty (that could be a good name for a snack?). I once drove home from a school visit in the FAR NORTH at twilight (that was my first mistake), it was misty and I was driving down a road where I swear there was a moose every 5 yards. I drove 30 miles at 5 MPH. I got home after six months. These moose were SO darn big and SO close to the car I could literally see up their nostrils. Man, moose need help with superfluous hair. Wow, you really did see up their nostrils. You are scaring me a little bit, Hazel. Eyes on the road. Speaking of scary . . .
Stephen King lives in the next town over, but you know, he’s a recluse. I eat lobster with lobster on top. Delish. When I moved to the US of A from over the pond I landed in the South. Then moved to Maine. I like the cold much better! (And the lobster). Do you have ideas for any more Toby stories? I think readers will want more. I do have more ideas about stories for Toby. But we will have to wait and see. Readers! Write to my publisher! I’m so glad you visited, Hazel. It’s nice spending time with you. 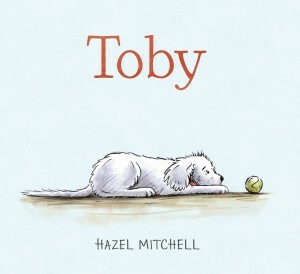 I hope Toby enjoys a long and mischievous life in children’s books. It’s been fun. Best five questions anyone asked me all morning. 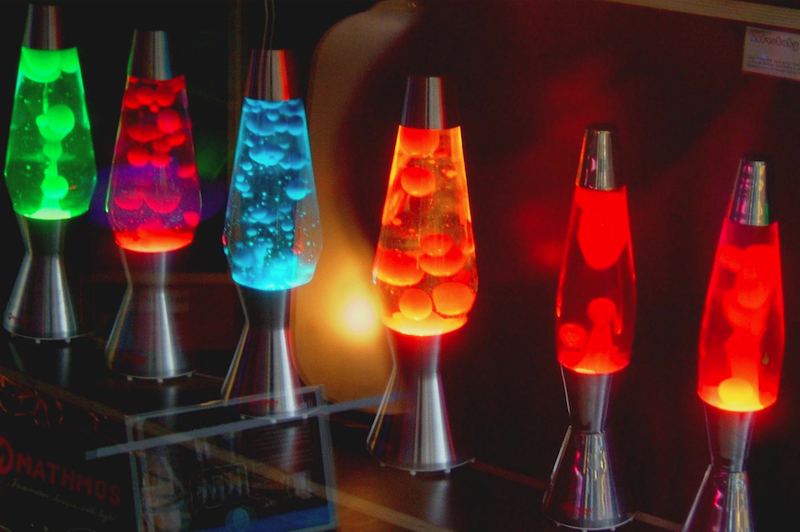 Thanks for having me drop by … oops … there goes a lava lamp! Six bucks down the drain. We’re done here. In addition to Toby, Hazel Mitchell has illustrated several books for children including Imani’s Moon, One Word Pearl, Animally and Where Do Fairies Go When It Snows? 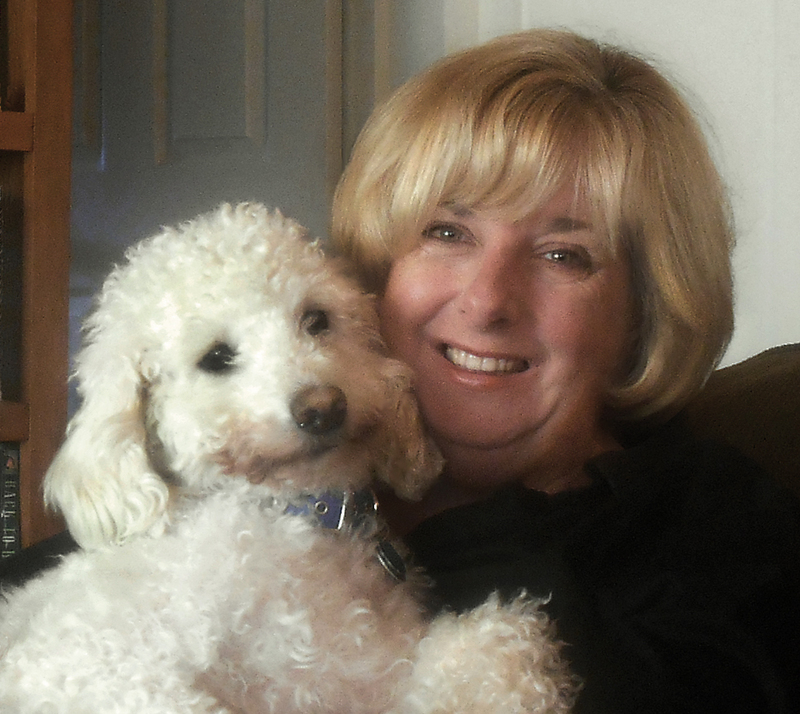 Originally from England, where she attended art college and served in the Royal Navy, she now lives in Maine with her poodles Toby and Lucy and a cat called Sleep. 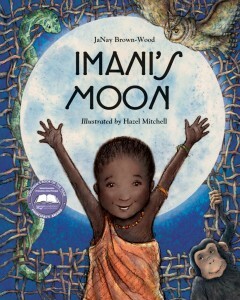 You may learn more about Hazel at www.hazelmitchell.com.